The Masters Program grad students participating in the SDSU Capstone Program and working on crime and safety in Del Cerro, have developed a survey and they are inviting all Del Cerro residents to participate. Here is the link to the survey. The Friends of Del Cerro and the Del Cerro Action Council are encouraging all Del Cerro residents to take a few minutes and complete the survey. 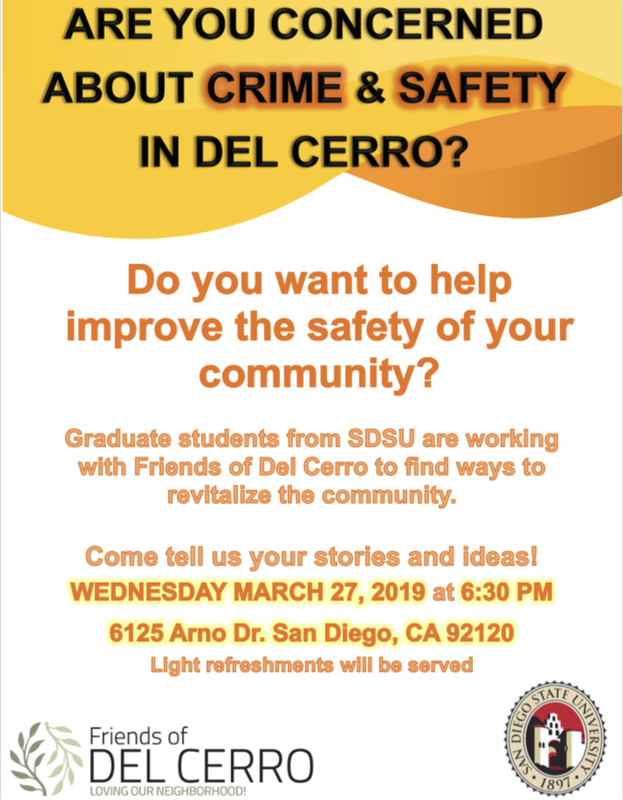 These same Masters Program grad students are hosting the community meeting on Del Cerro crime and safety tomorrow night, Wednesday, March 27. See the previous post for more information on time and location. 9. Public Comment – Up to 3 minutes regarding a community matter not on the agenda. Good Morning Del Cerro! A quick reminder that the Del Cerro Action Council is meeting MONDAY, Oct. 22 at 7 p.m. at Temple Emanu-El. This will be an opportunity to meet Adela de la Torre, the new President of SDSU, and to learn about her vision for SDSU. This is not a discussion of the two ballot measures relating to the “Qualcomm” property. We look forward to seeing you tomorrow night at Temple Emanu-El.